JAGUAR HAS WORKED hard over the last decade to build cars that buyers lust over, reinvent itself as a modern auto maker, and finally shake off its “old man sedan” image. Yes, the British car builder built the E-Type, the sexiest car ever, in the 60s. But then it bumbled along for decades until the mid 2000s, when it finally started pumping out hits to compete with the likes of Mercedes and BMW, like the XF sedan and the F-Type two seater, which is wildly good looking. The company has carried that design DNA over into more mainstream models, like the XE sedan, and what’s become its fastest selling car ever, the F-Pace SUV. 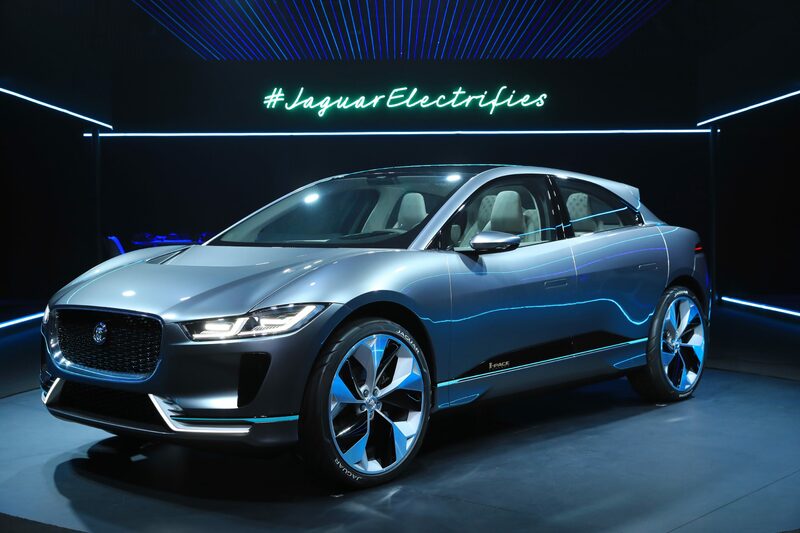 And now Jaguar is going after Tesla and the electric car market. I’m strapped into the passenger seat of its new vehicle, while the engineer at the wheel casually rockets away from all the other posh cars at the intersections in Beverly Hills, California. Jag is performing some final tests on its I-Pace, an all-electric SUV, and this one is still wrapped in loudly patterned plastic camouflage, drawing even more attention. The concept vehicle was unveiled at the LA Auto Show one year ago, where it won praise for its bold, sleek, design. Today, before the production vehicle goes on sale in 2018, the company is calibrating one of the first vehicles off the line. Jag isn’t ready to let an outsider drive, so Simon Patel, its senior powertrain program manager, is showing me what the car can do, which you can watch in the video above. Jaguar has brought the car to the LA Auto Show partially for the publicity, partly because the city is a good place for testing: the heavy traffic, hot weather, and rough pavements in Los Angeles give engineers the chance to tweak software settings for suspension, to adjust what they call NVH, for noise, vibration, and harshness. Thermal management systems need testing too, to keep both the battery and the occupants of the car cool, while still giving maximum possible range. “We’ve got cars running in hot markets like Dubai, to sign off the hot side of things, as well as Russia and Sweden for the low temperature stuff, and snow and ice,” says Patel. Lithium-ion batteries are happiest operating at 75 to 100 degrees Fahrenheit, but max power comes at a higher heat—115 degrees. Long term that can degrade battery life, and engineers are working to balance all these factors. Unfortunately, today’s tests call for the AC to be turned off, and the inside of the car quickly gets sweltering in the LA sunshine. There’s plenty of room though, in the front and the back, despite the fairly compact exterior dimensions. Since the car has no engine, exhaust, or fuel tank, Jaguar’s designers could push the usable space right out to the edges of the vehicle. The dash is still cloaked in heavy black felt to hide the final interior design as effectively as the camo hides the exterior lines, but expect sleek touchscreens in the center console to eventually control the heat, cool, and tunes. Today, we roll down the windows for air, but also to enjoy the near silence of an electric car. To compete with the likes of Tesla’s Model X, and Audi’s upcoming E-Tron Quattro electric SUVs, Jag hasn’t held back on the numbers. The I-Pace can access around 400 horsepower from two electric motors, for a 0-60 sprint in around four seconds. That’s plenty fast enough to mash my head back against the headrest (and elicit a giggle) each time Patel plants his foot. Range from the 90KWh battery pack will be over 250 miles, (if Jag sticks to what it showed in the concept, which is likely). That’s similar to Tesla’s top end car. Prices are likely to be top end too, but Jaguar isn’t ready to reveal that yet. Jaguar is building the car in Graz, Austria, and already reportedly has 25,000 people interested. The company sold 150,000 vehicles globally in 2016, which was up 77 percent on the year before. If it gets the I-Pace right the company could capitalize on the growing demand for both SUVs andelectric cars, and have another hit on its hands.